President Donald Trump, flanked by Sen. Tom Cotton, R- Ark., left, and Sen. David Perdue, R-Ga., speaks in the Roosevelt Room of the White House in Washington, Aug. 2, 2017, spotlighting legislation that would place new limits on legal immigration. President Donald Trump on Wednesday endorsed a measure to dramatically reduce the number of low-skilled immigrants admitted to the United States and introduce a merit-based points system. The RAISE (Reforming American Immigration for a Strong Economy) Act would limit the number of permanent residence permits, or green cards, to half a million a year. The current level is 1 million. The points system would let would-be residents' ability to speak English and earn a living be taken into account when their green card applications are considered. With the bill's sponsors, Republican Senators Tom Cotton of Arkansas and David Perdue of Georgia, by his side, Trump hailed the measure as another step toward fulfilling his campaign promise to put America first. He called it "the most significant reform to our immigration system in a half century." "As a candidate I campaigned on creating a merit-based immigration system that protects U.S. workers and taxpayers, and that is why we are here today," Trump said. "This legislation will not only restore our competitive edge in the 21st century, but it will restore the sacred bonds of trust between America and its citizens," he said. "This legislation demonstrates our compassion for struggling American families who deserve an immigration system that puts their needs first and that puts America first." Cotton and Perdue argue that the "generation-long influx of low-skilled immigrants has been a major factor in the downward pressure on the wages of working Americans." "The current system doesn't work," Perdue said. "We need a new approach. We need to fix this immigration system." He noted that the bill was based on laws that are working well in other countries with large immigrant populations. "What we're introducing today is modeled on the current Canadian and Australian systems — it's pro-worker, pro-growth, and it's been proven to work. Both have been extremely successful in attracting highly skilled workers to those countries." 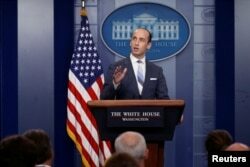 Senior White House official Stephen Miller, briefing reporters Wednesday, said the current immigration system has promoted a shift in wealth from the working class to wealthier corporations and businesses. White House senior policy adviser Stephen Miller discusses U.S. immigration policy at the daily press briefing at the White House in Washington, Aug. 2, 2017. "It has been very unfair for American workers, but especially for immigrant workers, African-American workers and Hispanic workers," he said. Miller, describing green cards as "the golden ticket to U.S. immigration," said the bill mandates several major changes. Among the most significant is elimination of "chain migration," which allows green card holders to bring in a large number of family members, who in turn can bring in more relatives in a chainlike series, he said. The White House event was designed to encourage support for the bill, which had been getting little attention on Capitol Hill. The Republican leadership has shown little inclination to vote on immigration this year. One key Republican, Senator Lindsay Graham of South Carolina, tweeted Wednesday that while he supported the idea of merit-based immigration, "if [the] proposal were to become law, [it would be] devastating to [South Carolina's] economy, which relies on this immigrant workforce." On the other side of the political spectrum, Democrats and immigrants' rights groups have also found fault with the bill. In a statement, Vanita Gupta, president and chief executive of the Leadership Conference on Civil and Human Rights, said, "We are a nation of immigrants, and proposals to cut down on family visas contradict our fundamental principles and values." Kim Rueben, a senior fellow at the Urban Institute in Washington, told VOA that limiting immigration could ultimately be counterproductive for the United States. "A lot of the lower-skilled immigrants are contributing vitally to our country," Rueben said. "They are doing things like helping our farms work better, doing manufacturing jobs and also working in the home. So without those people, it would make it much harder for all of us to do the jobs we're doing and for our economy to function." Earlier this year, nearly 1,500 economists sent an open letter to top Congressional leaders, stressing that "immigration represents an opportunity rather than a threat to our economy and to American workers." Groups that favor tighter limits, however, say their polling indicates that voters overwhelmingly favor strict immigration controls. "They know mass immigration creates unfair competition for American workers," said Roy Beck, president of the public policy group Numbers USA. Immigration expert Francis Buckley, a law professor at George Mason University in Fairfax, Virginia, said he found it ironic that a concept that enjoys broad support in other immigrant-rich countries such as Canada and Australia would engender such strong opposition in the United States. "Immigration is not such a contentious issue in Canada," Buckley said. "Canada is 20 percent foreign born, while the United States is 13 percent foreign born, so they are much more the country of immigrants, but it's not a political issue. Why? Because Canadians figure the game isn't rigged against them."